In the famous scene from Monty Python's Holy Grail, a man tries to convince an undertaker with a cart full of bodies that the old man he is carrying on his shoulder is dead. The alleged corpse protests, "I'm not dead yet." They debate the point. "I don't want to go on the cart," says the old man. "Don't be such a baby," says his captor. Twice people referenced this scene as I called around looking for the latest on immigration reform. It was not dead yet, various people suggested, even though House Speaker John Boehner just announced that progress was stalled because Republican members didn't trust the president. If that was the hurdle, it was the equivalent of idling the hearse, because trust is not likely to bloom afresh in the bosom of House Republicans in an election year on this volatile topic. But immigration reform backers were not taking this dark view. White House Press Secretary Jay Carney said Boehner's remarks were merely a sign that the process will take time. Sen. Chuck Schumer was not discouraged either. 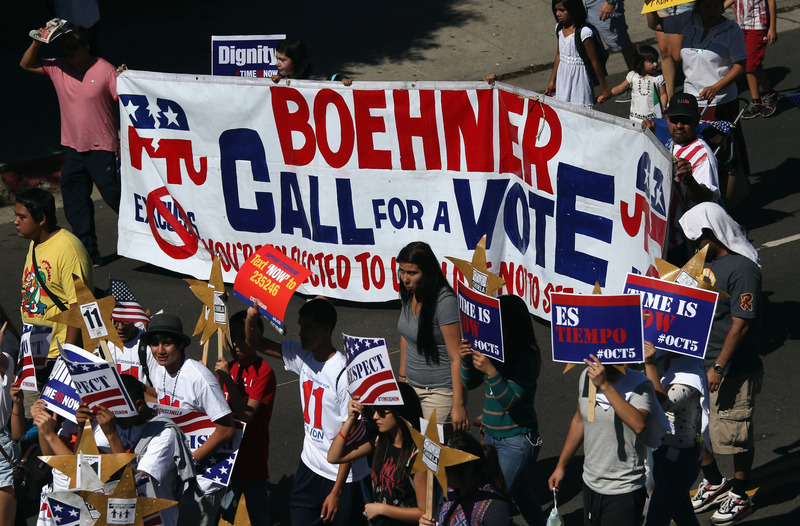 "I think Boehner has tried," said Simon Rosenberg, president of the New Democrat Network, and a longtime advocate of immigration reform. "We are as close as we've ever been. I haven't given up." It's a little surprising to hear Democrats giving the House speaker room to maneuver rather than rushing to denounce him. It is actually a sign of trust that they think he really does want to pass some form of immigration reform. It's also a recognition that little else would do much good. President Obama has not made a showy and sustained public push for reform, which Republicans working the issue say has been helpful, on the theory that when the president touches an issue, Republicans shy away from it, regardless of the merits. If anything is going to happen on reform, Boehner is going to have to shepherd it, so beating up on him isn't going to help matters. Immigration reform advocates are hoping that the lobbying groups and the GOP’s fears of permanently alienating Latinos will keep the pressure on for action. Those in the Republican Party who believe that improving relations with the Latino community is necessary for the GOP’s survival worry that putting off immigration reform until next year will be too late. The presidential jockeying will begin in early 2015, which will force the conversation to the right as the party's most public voices compete for its most conservative activists who are cool to sweeping reform. Rosenberg, of the New Democrat Network, also warns Republicans that by failing to act after having gotten a bipartisan bill through the Senate, they won't simply be missing an opportunity to court Latinos, they will be doing further damage to an already battered brand. So despite the public signs of gloom from Boehner, a case can be made for hope. That’s always nice. But in the Monty Python scene, the moral is not that hope wins out in the end, but that a stronger determined force typically triumphs. "I feel happy," sings the old man, trying to prove his vitality. Just as he does, the mortician dispatches him with a club, sending him to his reward and ending the debate. This is the inevitable truth of immigration reform. The forces trying to kill this reform are stronger than those trying to keep it alive. People working this issue see it this way: The House Republican conference came be divided into thirds. In this view, one third will never vote for any immigration reform that could actually be signed into law, one third would like to get an immigration bill, and one third is highly reluctant either because they lack trust or think it is politically dumb. Here is a key point: The conservative activists and grassroots groups who can punish members who vote for a bad immigration bill are stronger than the forces that are pushing for passage of the immigration bill. This is the shorthand Republicans use to explain the political balance of power. "The Chamber [of Commerce] and downtown [lobbyists] want it," says one GOP leadership aide, "but they're not going to primary anyone." Absent the clarifying force of an outside group putting a lot of money or enthusiasm behind a challenger, Republicans in individual districts don't face pressure from minority voters. There are 108 majority-minority districts and Republicans only hold nine of them. Of the 24 House Republicans who represent a district where the Latino population is 25 percent or higher, only a handful are vulnerable and could therefore be affected by a bold move on this issue that would affect voter opinions. Given this political landscape, why would Republicans want to have a fight over legislation that will divide their party, especially when they could spend their time attacking Democrats over Obamacare? It won't just be the policy that will divide Republicans. Any deal would require some kind of arrangement with President Obama. That's where the trust comes in. The substantive reason Republicans cite is that they don’t think Obama will enforce the stricter border security that would be a prerequisite for any deal that would allow some kind of permanent status for undocumented workers. Democrats point out that Obama has quite a strong deportation record and that he'll be out of office when the enforcement would take place. But facts are beside the point. The lack of trust in Obama is a toxic mix of anger over Benghazi, the IRS, and the president’s shifting promises on health care. A Republican politician is very nervous about making any deal that can be characterized as requiring faith in Obama. That would irritate their most ardent constituents and the next thing they know, they might find themselves arguing for their political life.